"Wake Me Up on Judgment Day"
Back in the High Life received very positive reviews. Timothy White of Rolling Stone magazine glowed that "With Back in the High Life, Steve Winwood has created the first undeniably superb record of an almost decade-long solo career", criticizing only the delay in its release. Karyn Albano, writing for the website "Classic Rock Reviews" went even further, designating it Album of the Year, with the summary description that "the album achieves that elusive goal of combining great songs that will stand the test of time while also catering to the commercial appeal of the day." All tracks written by Steve Winwood and Will Jennings except where noted. Ted Jensen – mastering at Sterling Sound, New York City. 1988 "Back in the High Life Again"
^ Ruhlmann, William (2011). "Back in the High Life – Steve Winwood | AllMusic". allmusic.com. Retrieved 7 August 2011. ^ Christgau, Robert (1986). "Steve Winwood". robertchristgau.com. Retrieved 24 May 2012. ^ White, Timothy (1986). "Steve Winwood: Back In The High Life : Music Reviews : Rolling Stone". web.archive.org. Archived from the original on 2009-02-13. Retrieved 7 August 2011. ^ "Back in the High Life – Steve Winwood | Credits | AllMusic". AllMusic. Retrieved 17 November 2016. ^ "GRAMMYs' Best Albums 1980–1989". grammy.org. 4 February 2008. Archived from the original on 30 August 2011. ^ "Past Winners Search". National Academy of Recording Arts and Sciences. Retrieved 1 May 2014. ^ a b Hunt, Dennis (9 January 1987). "GRAMMY NOMINATIONS: HIGHS AND LOWS : Winwood, Gabriel and Simon Garner Most Nominations". articles.latimes.com. Los Angeles Times. Retrieved 3 May 2014. ^ a b "Past Winners Search". National Academy of Recording Arts and Sciences. Retrieved 1 May 2014. ^ Hilburn, Robert (13 January 1989). "U2, Jackson Top Grammy Nominees : No Major Embarrassment Seen in Top Categories". articles.latimes.com. Los Angeles Times. Retrieved 3 May 2014. ^ "MTV Video Music Awards: 1987 VMA Winners". Retrieved 3 May 2014. ^ "MTV Video Music Awards: 1988 VMA Winners". Retrieved 3 May 2014. ^ "Top Albums/CDs – Volume 45, No. 3" (PHP). RPM. 11 October 1986. Retrieved 3 May 2013. ^ "dutchcharts.nl Steve Winwood – Back in the High Life" (ASP). dutchcharts.nl. MegaCharts. Retrieved 1 May 2014. ^ a b "Hit Parade Italia – Gli album più venduti del 1988" (in Italian). hitparadeitalia.it. Retrieved 1 May 2014. ^ "charts.org.nz Steve Winwood – Back in the High Life" (ASP). Recording Industry Association of New Zealand. Retrieved 1 May 2014. ^ "swedishcharts.com Steve Winwood – Back in the High Life" (ASP). Sverigetopplistan. Retrieved 1 May 2014. ^ "Steve Winwood – Back in the High Life – hitparade.ch" (ASP). Retrieved 1 May 2011. ^ "Steve Winwood > Artists > Official Charts". UK Albums Chart. Retrieved 1 May 2014. ^ a b "Allmusic: Back in the High Life : Charts & Awards". allmusic.com. Retrieved 1 May 2014. ^ "Album Search: Steve Winwood – Back in the High Life" (ASP) (in German). Media Control. Retrieved 1 May 2014. ^ "RPM Top 100 Albums of 1986". RPM. Retrieved 1 May 2014. ^ "Dutch charts jaaroverzichten 1986" (ASP) (in Dutch). Retrieved 1 May 2014. ^ "Complete UK Year-End Album Charts". Archived from the original on 19 May 2012. Retrieved 2 April 2014. ^ "Billboard.BIZ – Year-end Charts – Billboard 200 – 1986". billboard.biz. Archived from the original on 9 December 2012. Retrieved 1 May 2014. ^ "Top 100 Albums of '87". RPM. 26 December 1987. Retrieved 2 May 2014. ^ "Top Pop Albums of 1987". billboard.biz. Archived from the original on 2 August 2012. Retrieved 2 May 2014. 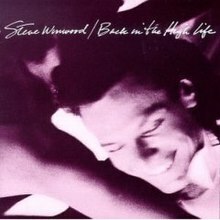 ^ "British album certifications – Steve Winwood – Back in the High Life". British Phonographic Industry. Retrieved 10 October 2013. Select albums in the Format field. Select Gold in the Certification field. Type Back in the High Life in the "Search BPI Awards" field and then press Enter. ^ "American album certifications – Steve Winwood – Back in the High Life". Recording Industry Association of America. Retrieved 10 October 2013. If necessary, click Advanced, then click Format, then select Album, then click SEARCH.